This book provides a concise guide to the selection, design and installation of the wide range of security systems in use in domestic, public and commercial contexts. The range of products covered includes intruder alarms, fire alarms, call systems, access control, vehicle protection, emergency and security lighting, closed circuit TV (CCTV) and intercoms. Electronic Protection and Security Systems is essential reading for all security system installers and designers. It is also an invaluable guide for managers selecting and supervising security systems, local government, police, and security-conscious householders and vehicle owners. This book provides a wide ranging foundation for SITO NVQ students. 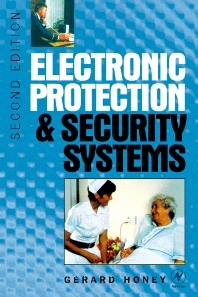 The second edition of this popular book has been updated to cover the latest technology in ID, communication equipment, fire alarm wiring techniques, TV camera links, wireless systems, Paknet, etc. Gerard Honey's clear, practical text draws on his wealth of experience designing and installing security and protection systems. He is also the author of Intruder Alarms, a comprehensive text for the SITO NVQs in that topic. Preface; Intruder alarms; Lighting; Call and access control; Fire alarms; Miscellaneous security methods; Wiring Systems; Reference Information; Index. Gerard Honey is an experienced international installer and well known author within the electrical and electronic security and safety areas. He is married with two grown up children and spends part of his time in the north of England, the remainder working abroad. He promotes a healthy lifestyle and swims and cycles on a regular basis, but has an interest in most other sports also - particularly football. Gerard Honey is practical and sees all installations in real terms as he understands technical limitations and working problems. Experienced systems installer, Durham, U.K.